As parents and teachers, we know the power of Spanish children’s songs to energize kids, change their mood and, of course, teach language. 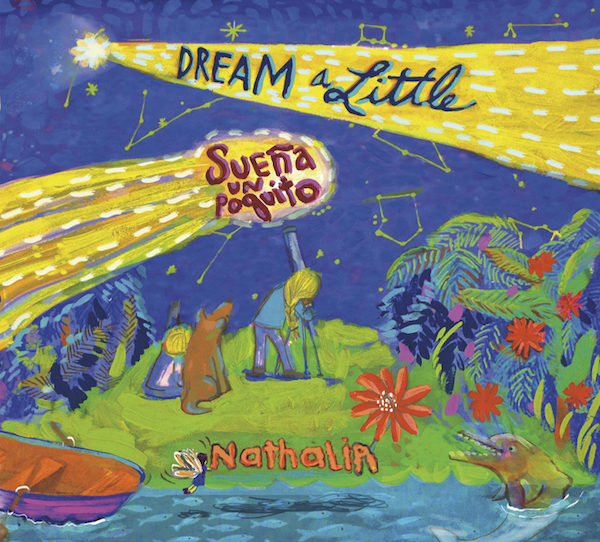 Nathalia’s new CD Dream a Little – Sueña un Poquito is full of energy and positive messages. 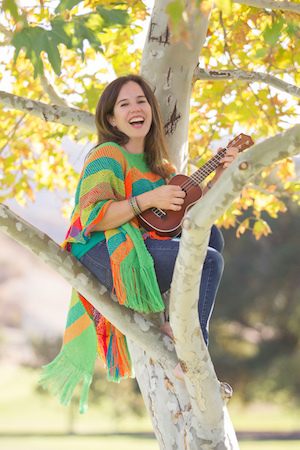 In addition to being an accomplished professional musician, Nathalia is an early childhood music educator, music therapist, family therapist and mom. She is originally from Colombia, and her culture influences the style of her Spanish children’s songs. Dream a Little – Sueña un Poquito is available on Amazon, iTunes, and cdbaby. The songs on Dream a Little – Sueña un Poquito combine English and Spanish. If you read much on Spanish Playground, you know that I recommend Spanish children’s songs without translation for language learners. That said, there is always room for more music and more Spanish in a child’s life! These Spanish children’s songs are a wonderful way to give your child both. There is lots of language with a significant amount of repetition. The music has a bright, contemporary sound that appeals to a wide range of ages. This is upbeat music that makes kids want to sing and dance. These Spanish children’s songs have affirming, empowering messages. Songs like Pop Pop Pop and Shake Them Bones specifically incorporate movement. In several songs, the languages are blocked, so children hear the song in one language and then the other. The songs Los planetas and El Amazonas would be excellent additions to units on space and the environment or geography. The lyrics are available online. You can hear the songs from Nathalia’s first CD and see videos of songs from Dream a Little – Sueña un Poquito on her website. I’ll just mention a few of my favorite Spanish children’s songs on this CD and let you check out the others on your own. Tu día puedes cambiar – This is such an empowering song! It teaches kids how to actively take control of their mood. I like that the languages are separated, so that children hear the whole song in Spanish and then in English. Shine – This song makes you want to sing along. It is great fun to dance to and has a message we all want kids to hear: Tú puedes ser tú. Yo puedo ser yo. Tú puedes brillar. Sueño feliz – This is one of my favorite Spanish children’s songs on the CD. It is almost completely in Spanish and would be perfect as part of a bedtime routine. In addition to being very sweet, it uses lots of typical bedtime phrases: la noche llegó, la luna salió, vamos a dormir, cierra tus ojitos, duerme ya, es hora de dormir, a dormir, que sueñes feliz. Dream a Little – Sueña un Poquito is a wonderful way to expose children to lots of Spanish. The songs also convey positive, empowering messages to kids. Just as important, the music is fun and engaging, so that kids will want to listen again and again! You can follow Nathalia on Facebook and Twitter.